Mission Control sounds complicated, but the MacBook is all about convenience. If you typically run a large number of applications at the same time, Mission Control can be a real timesaver, allowing you to quickly switch between a forest of different application windows (or display your desktop instantly without those very same windows in the way). Most MacBook owners are comfortable using the cmd+Tab keyboard shortcut to switch between open applications. If you’ve moved to the Mac from a PC running Windows, you might think this simple shortcut is all there is to switching applications. Ah, dear reader, you’re in Mountain Lion territory now! Press Control+↑ to show all open windows, grouped by application, and then click the one you want. Move the cursor on top of the window you want to activate — the window turns blue when it’s selected — and click once to switch to that window. You can specify which keys you want to use in the Mission Control pane in System Preferences. Press Control+↓ to show all open windows from the application that you’re currently using; click the one that you want to activate. This Mission Control function is great for choosing from all the images that you’ve opened in Photoshop or all the Safari web pages populating your desktop! Along with the window switch, an astute observer will notice that the application menu bar also changes to match the now-active application. Press F11 (or cmd+F3), and all your open windows scurry to the side of the screen. (Much like a herd of deer if you dropped a mountain lion in the middle.) Now you can work with drives, files, and aliases on your desktop — and when you’re ready to confront those dozen application windows again, just press the keyboard shortcut a second time. Although the Mission Control screen appears automatically when necessary, you can also launch it at any time from your MacBook’s Launchpad display, from the Dock icon, or by pressing the Mission Control key on your keyboard. From the trackpad, you can display the Mission Control screen by swiping up with three fingers. What if you want to switch to an entirely different set of applications? Suppose that you’re slaving away at your pixel-pushing job, designing a magazine cover with Adobe Illustrator. Your page design desktop also includes Photoshop and Aperture, which you switch between often. Suddenly, however, you realize you need to schedule a meeting with others in your office using Calendar, and you want to check your e-mail in Apple Mail. What to do? Well, you could certainly open Launchpad and launch those two applications on top of your graphics applications, and then minimize or close them. But with Mission Control’s Spaces feature, you can press the Control+← or Control+→ sequences to switch to a completely different “communications” desktop, with Calendar and Apple Mail windows already open and in your favorite positions! Spaces creates a new empty desktop thumbnail. Switch to the new desktop by clicking the thumbnail at the top of the Mission Control screen and then open those applications you want to include. 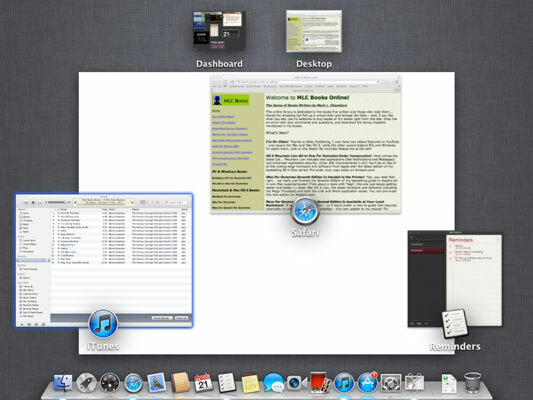 (Alternatively, you can drag the applications from Mission Control onto the desired Desktop thumbnail.) That’s all there is to it! To switch an application window between Spaces desktops, drag the window to the edge of the desktop and hold it there. Spaces will automatically move the window to the next desktop. You can also delete a desktop from the Mission Control screen. Just hover your mouse pointer over the offending Spaces thumbnail and then click the Delete (X) button that appears. You can jump directly to a specific Spaces desktop by clicking its thumbnail in your Mission Control screen. You can also hold down the Control key and press the number corresponding to a desktop. Finally, you can always use the Control+← and Control+@ra shortcuts to move between desktops and full-screen applications.